What is ITIL (IT Infrastructure Library)? born. ITIL guidance has since been a successful mechanism to drive consistency, efficiency and excellence into the business of managing IT services. does not directly interact with it, but technology services are necessary as part of the overall value chain of the business service. 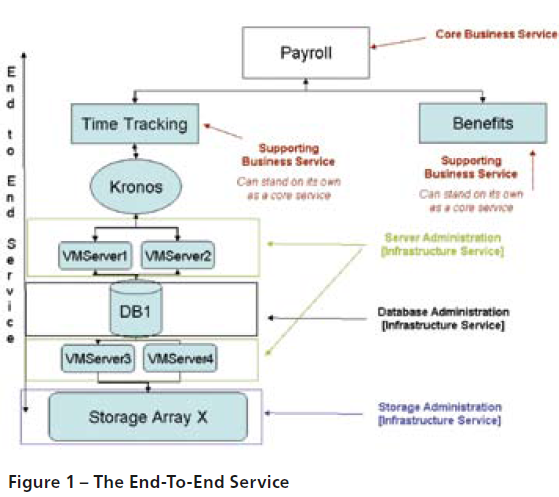 “Server Administration”, “Database Administration”, “Storage Administration” are all examples of technology services required for the successful delivery of the Payroll business service. we are considering every aspect of a service (and not just the individual technology silos) – to assure that we are delivering the required functionality (or utility – accurate paychecks for all employees) and service levels (or warranty – delivered within a certain timeframe, properly secured, available when necessary) to the business customer. for executing successfully. Driven through strategy and throughout the course of delivery and support of the service, IT must always try to assure that cost of delivery is consistent with the value delivered to the customer. Service Design assures that new and changes services are designed effectively to meet customer expectations. The technology and architecture required to meet customer needs cost effectively is an integral part of Service Design. Additionally, processes required to manage services are also part of the design phase. service validation and testing and transition planning to assure that users, support personnel and the production environment has been prepared for the release to production. daily routine end user requests and managing service access. Enveloping the Service Lifecycle is Continual Service Improvement (CSI). CSI offers a mechanism for IT to measure and improve the service levels, the technology and the efficiency and effectiveness or processes used in the overall management of services. Why would an organization be interested in ITIL? service expectations while working as efficiently as possible. Consistent repeatable processes are the key to efficiency, effectiveness and the ability to improve services. These consistent, repeatable processes are outlined in the ITIL framework. implementation of Service Portfolio Management gives IT the opportunity to understand the business’ current and future needs and develop service offerings that can address them. • Negotiated achievable service levels. Business and IT become true partners when they can agree upon realistic service levels that deliver the necessary value at an acceptable cost. • Predictable, consistent processes. Customer expectations can be set and are easier to meet with through the use of predictable processes that are consistently used. As well, good practice processes are foundational and can assist in laying the groundwork to meet regulatory compliance requirements. • Efficiency in service delivery. Well-defined processes with clearly documented accountability for each activity as recommended through the use of a RACI matrix can significantly increase the efficiency of processes. Inconjunction with the evaluation of efficiency metrics that indicate the time required to perform each activity, service delivery tasks can be optimized. used key performance indicators such as Mean Time To Restore Service can be captured to determine whether this KPI is trending in a positive or negative direction so that the appropriate adjustments can be made. Additionally, under ITIL guidelines, services are designed to be measurable. With the proper metrics and monitoring in place, IT organizations can monitor SLAs and make improvements as necessary. • A common language – terms are defined. How to decode MTSMS Origination number in Oracle PL/SQL? CDR is generally known as data file for storing Traffic in Telecom Company. With ASN.1 format decoder, It could not convert all value of each field in CDR. Incoming SMS is an example. How to decode it to be readable with the following hexa number?